When I first started practicing medicine, I only had a few warnings for my patients when it came to their choice of beverages. Limit their consumption of alcohol, soda and milk – or avoid them altogether. But in the past few decades… whew! The list of things to avoid just keeps growing longer and longer. These days, you can find all sorts of beverages at the store. Most of them are unhealthy, unnatural and not fit for consumption. Canned or bottled sodas and teas are loaded with (high-fructose corn syrup (HFCS) and artificial sweeteners. Fruit juices are spiked with sugars, syrups and artificial ingredients. And most vegetable juices contain enough sodium to start a salt mine. Even sports drinks and nutritional shakes often contain excessive amounts of sugar, sodium and artificial sweeteners. And I’ve already told you the story behind what milk does to your body. It’s tempting to reach for any of these beverages when you’re doing your shopping. And they might quench your thirst. But they certainly aren’t going to do much of anything else that’s good for you. However, medicinally speaking, there is one beverage that has been recognized as a “cure-all” for centuries. And today’s top-notch researchers have consistently validated the health benefits of this legendary drink. It’s something you can drink several times a day, and you might find yourself feeling and looking a little younger – and filled with newfound energy that puts a little extra pep in your step. What is this wonderful and mysterious drink? Well, it’s something that used to be in the news on a regular basis. But we don’t hear much about it anymore. I’m talking about green tea. And even if the news-hounds aren’t pouncing all over it these days, the amazing health benefits that come from drinking green tea are just as relevant and important as ever. Maybe even more so, because today we know more about it than ever before. Recent research is showing that just two to three cups of green tea each day can protect your genes, preserve your DNA and keep you younger, longer. On one hand, green tea works at the genetic level. In fact, it can reduce damage to your genes by about 20%. Now you might think you’re just born with a set of genes and that’s that. But damage to these genes occurs as we age. And here’s the thing. Some people’s genes are more easily damaged than others. Once damage occurs, it can trigger all sorts of problems – cancer, heart disease, depression and even obesity. So, any protective action you can get from green tea is a big benefit when it comes to your genes, and that’s a big plus when it comes to warding off age-related diseases. I’ve talked about telomeres before. These are strands of DNA found at the ends of your chromosomes. And it’s these stretches of DNA that make it possible for your cells to divide and replicate. They also preserve your genetic code. However, there’s a big problem with telomeres. As your cells divide and your chromosomes grow older, these telomeres get shorter and shorter. And the quicker your telomeres shorten, the faster you age. 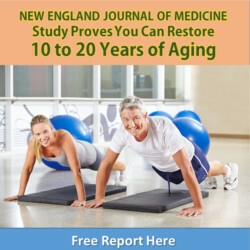 Longer telomeres, on the other hand, are associated with robust health and a longer lifetime. People who drink about three cups of green tea each day have longer telomeres than people who don’t. And they aren’t just a little bit longer… they’re a lot longer! In fact, green tea drinkers have telomeres that are about five years younger than people who don’t drink it. Now, that’s really saying something! And there’s no reason at all you can’t start enjoying a younger and healthier life right away. Simply invest in a good matcha, longjing or other green tea of your choice and enjoy several cups (hot or cold) each day. Not a green tea drinker? Don’t worry. You can still get in on its protective properties with a green tea supplement. Look for a supplement that contains epigallocatechin gallate (EGCG) and is standardized to contain 60% polyphenols. Catherine Baker. “Your Genes Your Choices.” The American Association for the Advancement of Science, 1999. Han KC. “Genoprotective effects of green tea (Camellia sinensis) in human subjects: results of a controlled supplementation trial.” British Journal of Nutrition. 2011 Jan;105(2):171-9.